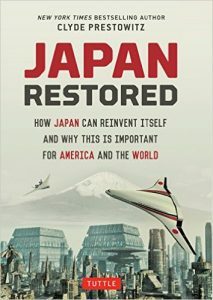 Clyde Prestowitz, Japan Restored: How Japan Can Reinvent Itself and Why This is Important for America and the World (North Clarendon: Tuttle Publishing, 2015). So the author and/or the publisher decided to proceed with forwarding me Japan Restored, presumably thinking that the power of the work could withstand any of my preconceptions. Now that I have received the book and read it—well part of it—I should really have declined. I do not deal well with futuristic conjecture, especially when it pretty much crosses the line into a setting for a science fiction novella, but without the pretense of offering any real social/psychological insights. Pretty harsh? Maybe, but the cover picture shows a futuristic city, futuristic aircraft, with Fujiyama set in the background (no cherry blossoms). The first chapter sets the future scene; the rest of the book attempts to explain how it came about. More realistically the author should simply have argued that there are certain changes that need to be implemented in order to revive, in essence, all of Japanese cultural and financial activities. In other words, describe Japan as it is now, rather moribund economically and hanging on a financial thread, and then write about what is necessary to revitalize it; forget the sci-fi conjecture. This leads to one of the ideas to be developed later in the book, that Japan needs “a series of deregulatory measures [to transfer] land used for small farming into residential or commercial farming.” Whoa…what? Mexico is a good example of the worst of this idea, as highly subsidized U.S. corn pushed small farmers off their land, making it easier for the rentier economy—the FIRE sector—to make huge profits, while the former tenants were reduced to wage labor status without land. The last thing Japan needs to do is reduce its agricultural base. 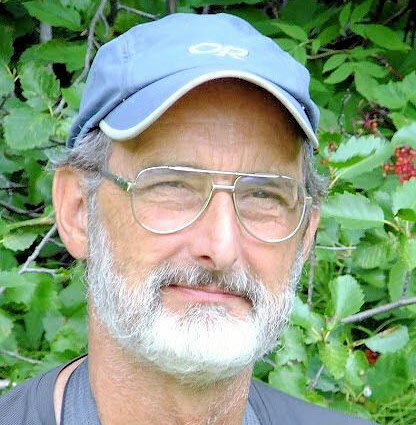 Further, the question then arises about the corporate agricultural industries such as Dupont, Monsanto, Cargill, Syngenta and others who would gladly get their hands on the land and turn it into industrial usage mostly for their own profits with little benefit to the local population. Prestowitz posits “spacious homes surrounded by pleasant gardens,”—all very nicely suburban U.S.A. Detroit maybe? Could these happen? Well, sure, but will they? All of them? Call me again in December 2016 for an assessment. And what about the Kuril Islands and Russia? What about the growing China-Russia geostrategic alliance? What about the Fukushima cleanup, have they got it done yet? What about the current financialized U.S. economy and its massive QE and its consequences globally? What about the Chinese—who incidentally are conjectured as being fifty per cent of the immigrants to Japan so why learn English and not Chinese—and their potential role with the global economy and a potential new gold standard of some kind? None of these items are recognized and dealt with in the work. Therefore, I skim read the rest, and sure, perhaps I missed an interesting idea or two but within this highly conjectural context, they are pretty much irrelevant to reality. By skim reading, as explained by a university prof long time ago, I read the first paragraph or two of each chapter and the last paragraph or two, then skipped through the pages looking for catchwords and phrases. Pardon the sarcasm, but really, can the U.S. with all its military interventions to achieve/maintain its perceived hegemonic global role truly be a force for peace? In contradiction, it is that military attitude and rhetorical exceptionalism that is creating the vast majority of the “suffering world.” Sure, a Pax Americana, supported by gunships, cronies, and oligarchies, but not much for the common human. I believe in democracy and the rule of law, but would rather have it demonstrated as it is really meant, not through the barrel of a gun or the manipulations of the financialized corporations. Finally, “Japan’s continuing demise would be tremendously destabilizing, especially in the Asia-Pacific region, but also globally.” His essential argument boils down to a stronger Japan with a weakening U.S. Yeah, like that will ensure democracy and peace, nuclear armed battleship Japan. As I indicated above, call me again in December 2016, and I will see how it is working out. In the meantime, I can only recommend not reading Japan Restored unless you enjoy working with some rather fanciful conjecture.